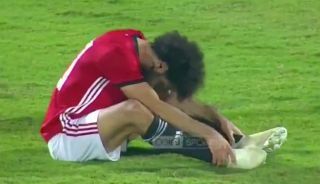 Mohamed Salah experienced a mixed night on Friday during Egypt’s clash with Swaziland as he scored in a 4-1 win before picking up an injury. The 26-year-old found the back of the net directly from a corner but after sustaining a problem in the 88th minute, he was eventually replaced in stoppage time after initially continuing. Naturally, that would have raised real concerns for Liverpool who will be desperate to avoid seeing him pick up a fresh injury problem, with BBC Sport now reporting that the Egyptian international has returned to Merseyside to undergo further treatment. Salah hasn’t been able to find his best form so far this season, scoring just three goals while providing two assists in 11 appearances in all competitions as he hasn’t looked quite right. After racing to be fit for the World Cup this past summer after sustaining a shoulder injury in the Champions League final last season, there could be an argument that he hasn’t been given sufficient time to fully recover from that setback. In turn, with this fresh injury concern, it will be another blow for Liverpool if he is forced to spend the rest of the international break recovering from the issue with his participation against Huddersfield Town on October 20 now surely in doubt. The Reds also face Red Star Belgrade and Cardiff City before the month is over, albeit with Jurgen Klopp still able to call on the likes of Roberto Firmino, Sadio Mane and Daniel Sturridge, he should have enough to cover the absence of Salah if he is indeed deemed unfit to feature in the coming weeks.